Overdid it again with the shopping, eh? 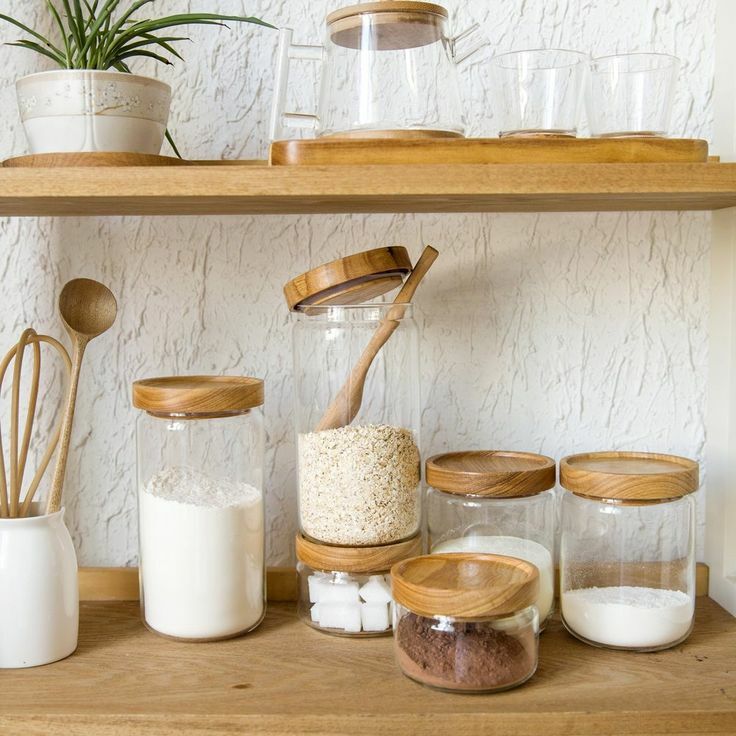 While buying in bulk is, no doubt, a great way to save $$$, storing supplies that you cannot use up right away may be problematic for those living in a small apartment. Even those who have lots of room to spare will have trouble stashing bulk items away. If you’re into baking and you need pretty containers for baking goods, try decanting your supplies in glass jars. You can store anything from sugar to nuts, coffee to pasta in giant glass jars. Don’t forget to add a scoop so you can get the ingredients you need quickly! 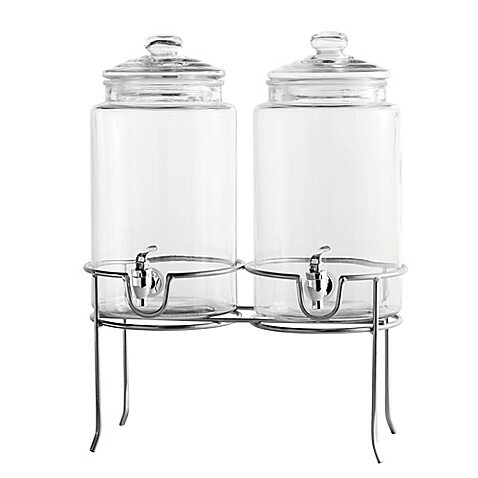 Large giant glass jars will look fabulous on your pantry or kitchen counter, especially if they are lined up neatly. Just make sure you’re getting glass jars with an airtight lid to preserve the freshness of your staples! Love cooking with dry herbs and spices? Most of these cooking essentials are on sale year round and buying them in bulk makes perfect sense if you love to cook. Now the problem with buying herbs and spices in bulk is that these could go stale when stored for a long time. 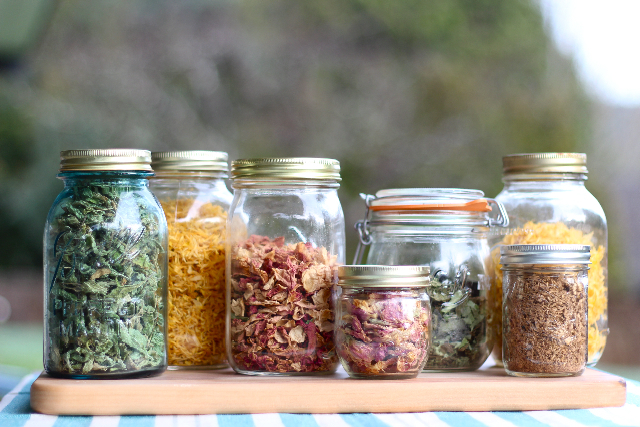 Here’s a great trick: transfer dry herbs and spices in canning jars. Canning jars have airtight lids that’ll protect the products from air exposure, extending the shelf life of the herbs and spices while also preserving their potency. After transferring the herbs into these jars, line ‘em up neatly in the pantry or kitchen counter then slap on a label so you can tell what kind of herb is inside at a glance. I struggle with limited storage space myself, which is frustrating since I have 3 cats and 2 dogs to feed with almost zero room for sacks of pet food. That’s why I invest in these compact airtight bins. These bins allow me to buy sacks of pet food and save more money. The storage bins stack up neatly so they won’t eat up a huge chunk of floor space. You can store these bins in any tight corner. Some bins are also wheeled so taking them from point A to point B is so much easier on the back. 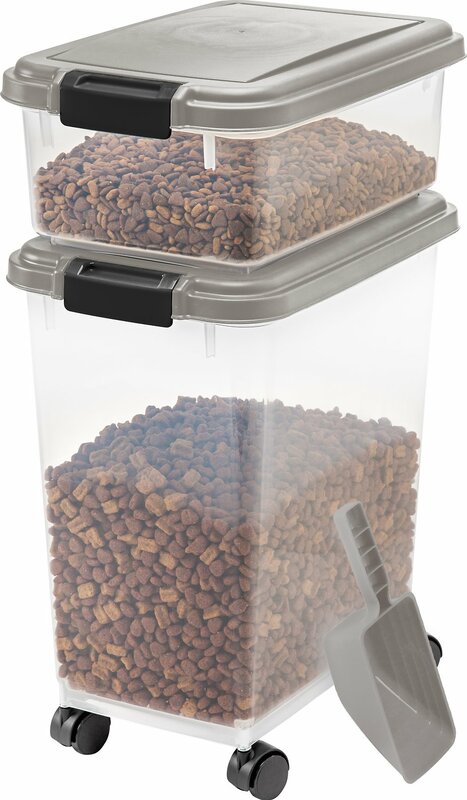 Best of all, these bins will extend the shelf life of the product so you can store sacks of them without fear of the dog food going stale. When shopping for airtight bins, choose those with dimensions that fit your storage space. 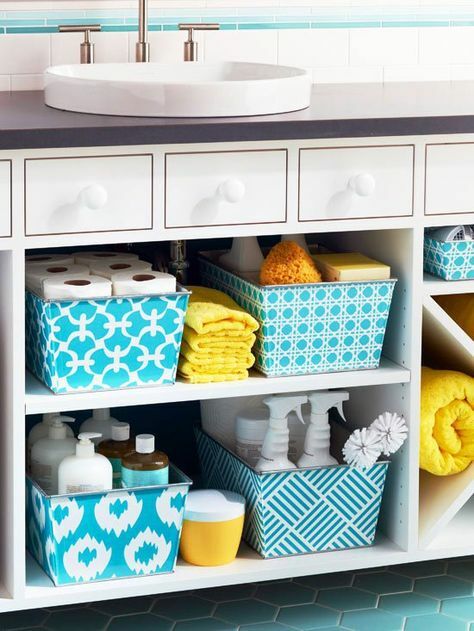 Trouble storing bathroom supplies? Bins and baskets will come in handy! You can use bins and baskets to store rolls of tissue paper, bottles of bath gels, lotion, shampoos, and bars of soap. You can stash the bins under the sink if you don’t have a bathroom cabinet or on the thin slice of space between your kitchen cabinet and the ceiling. You can even store the bins near the shower just so it’s much easier to grab a bottle of shampoo, a bar of soap, or a roll of tissue paper every time you’re running low. Love those old school glass beverage dispensers? Try this neat trick: use a couple of these to store your liquid detergents and other liquid cleaning products. Storing cleaning products in their original packaging is one way to lose storage space, fast! They are bulky and a pain to organize. By transferring your liquid cleaning products in a dispenser, you can keep your laundry cabinet or counter clear. When shopping around for these dispensers, make sure to get those with a spigot that you can lock. This will help prevent spills and leaks when the dispensers are not in use. Is your pantry brimming with food items you haven’t touched in months? You might want to check the expiration dates of these items. Don’t wait for months before using up your supplies, especially canned items that are nearing their expiry dates. These items could end up being tossed in the trash if you don’t use them up. Use your supplies right away so these products won’t pile up after another shopping spree. 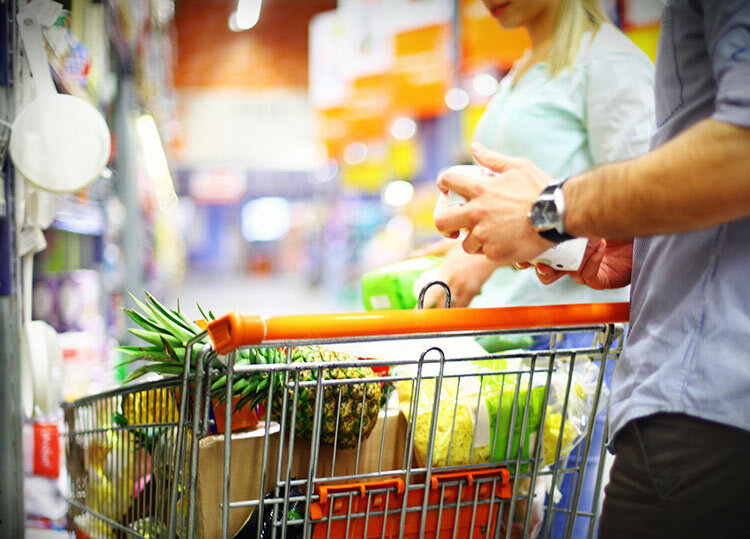 Before heading out to the nearest warehouse club, make a list of all your essentials then stick to it. It might be tempting to hoard all the buy-3-get-1-offers but if you have zero room for these items, you might end up with a lot of stuff you don’t really need. In addition, check the per-unit pricing of the items you are buying. Just because it comes in a huge container doesn’t mean you’re really saving money. Think getting a vacuum sealer is a bit much? If you make bulk purchases regularly, it’s worth the investment. A vacuum sealer seals large and small food items alike, including cheese, fruits, and vegetables, so they won’t spoil easily. Vacuum bags can be bought in bulk anyway. You can add the bags to your list of essentials so you’ll never run out.